Doug spends equal time on the road as a founding member of the iconic 80’s rock band Loverboy, (providing keyboards, sax, vocals & Harmonica) and at his home studio in the Vancouver area of British Columbia. Doug’s original compositions are heard around the world on TV shows, radio stations, movies, and on the internet. He has written commission pieces for the City of Surrey’s Winter Olympics 2010 torch lighting ceremony and the BC Summer Games 2011/2012 opening ceremonies. Doug’s diverse musical capabilities includes live performances in rock, jazz and classical concerts. 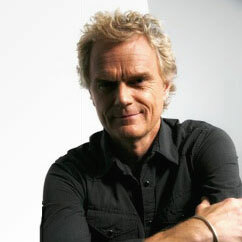 His many awards include induction in the Canadian Musical Hall of Fame. Leo Award nominations, and ARCT Silver Medal Status. 1975 – graduated Silver Medal A.R.C.T. 1976 – became piano teacher at Langley Community Music School. 1979 – began collaborating with Paul Dean and Mike Reno to eventually form “Loverboy“. 1982 – won 1st runner up Keyboard magazine “best new talent. 1988 – began second career as composer for film, TV and documentaries. 2010 – wrote “From My Home” Winter Olympics 2010 Surrey, BC theme song. 2012 – Loverboy tours with Journey (80s shows) on North American tour.